This beautiful, antiqued gold leaf wall mirror has a double-trim frame that creates a spectacular three-dimensional style statement in any room. The hand-forged iron frame on this cut-corner rectangular wall mirror is finished in a lightly antiqued gold leaf. Its double-trim, three-dimensional design has the look of a spectacular serving tray, giving it a timeless bit of style. 20" wide x 29 3/4" high x 3" deep. Hang weight is 15 lbs. Glass only section is 19 3/4" wide x 29 1/4" high. Surrounding frame is 1" wide. 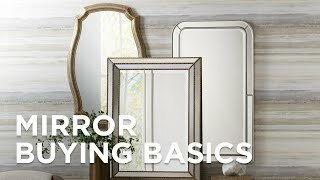 Decorative cut-corner rectangle wall mirror from Uttermost. Lightly antiqued gold leaf finish frame. Hand-forged iron frame with MDF backing. 3D double-trim frame design. Beveled mirror glass. Need it for my Ottoman, saw it in a store! something for a small alcove hallway that can be seen from other rooms in our open concept home. Feel like this mirror is just the thing. Also, have bought other Uttermost products. Love those too. The looks, the weight limit my wall, and the price. To dress a powder room with limited space between the backsplash and the light fixture. Most of your mirrors are far too tall! BEST ANSWER: Hi, the top measures 11" wide and the side measures 20 3/4" in length. Accent your favorite room with this handsome mirror design that features an etched glass border. This elegant oval wall mirror is accented with a beaded detail in the frame. Wonderful gold leaf finish gives this mirror on its own stand a special patina that enhances your decor.